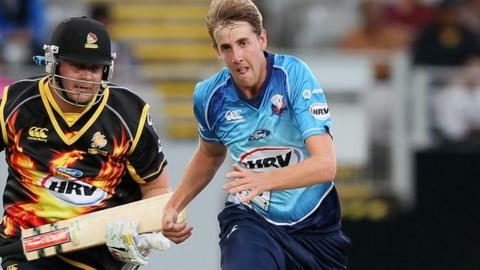 Essex have signed New Zealand A fast bowler Matt Quinn on a three-year deal. Auckland-born Quinn, 22, holds a UK passport and will not therefore count as an overseas player. He is the first signing by the county since Thursday's appointment of former England paceman Chris Silverwood as head coach. "Matt is a tall, fast bowler who can swing the ball. We've made no secret of the fact we want to bolster the bowling attack," said Silverwood. "Having looked at Matt play, alongside his record in New Zealand, he's got a good pedigree." Matt Quinn has taken 62 first-class wickets for Auckland at an average of 28.29. He has also claimed 23 wickets in Twenty20 cricket for the Auckland Aces in the Super Smash competition and 25 in List A cricket. Quinn will play in all three formats of the game for Essex. Essex have had quite an overhaul since the appointment of former captain Ronnie Irani as their new cricket committee chairman. England one-day international Reece Topley has joined Hampshire, while former skipper Mark Pettini has moved to Leicestershire and former England spinner Monty Panesar, Greg Smith, Matt Salisbury and Saf Imtiaz were all released at the end of last season. But slow left-arm spinner Aron Nijjar and young fast bowler Aaron Beard have both signed their first professional contracts, while England all-rounder Ravi Bopara, opening batsman Jaik Mickleburgh, limited-overs captain Ryan ten Doeschate and England Under-19 all-rounder Callum Taylor have all agreed new deals.